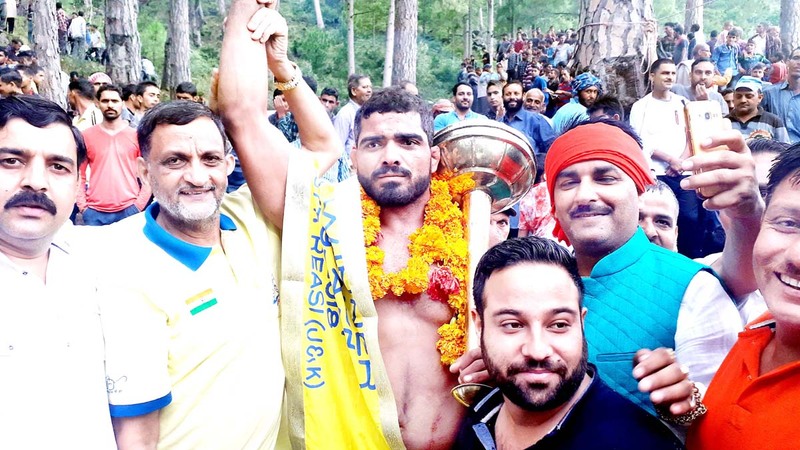 REASI, Sept 3: Udhampur Wrestler Ajay Sharma of Landen Power House Udhampur lifts “50th Annual Sujandhar Kesari Dagal Title by defeating Wrestler Ranjeet Singh of J&K Police in the main first malli bout that lasted for 8 minutes at village Sujandhar in Tehsil Bhamag, here. Dangal was organized by Sujandhar Dangal Committee in collaboration with J&K Indian Style Wrestling Association, under the overrall supervision of Sohan Singh (Sonu), President Purana Daroor Dangal Committee, Prem Singh, President Sujandhar Dangal Committee and Devinder Singh (Mangu), General Secretary Sujandhar Dangal Committee. 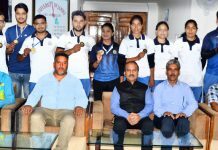 Treasurer Indian Style Wrestling Association of India, Shiv Kumar Sharma who is also President J&K Indian Style Wrestling Association, Associate Vice-President Wrestling Federation of India was the chief guest on the occasion who distributed cash prizes of Rs 1,85,000 among the Wrestlers. Sohan Singh (Sonu) presided over the function. NC Leader Saraf Singh, Tehsildar Katra who is also Mela Officer Akshay Rajan, Tehsildar Gulair Singh and BDO Shanker Dass were the guests of honour. 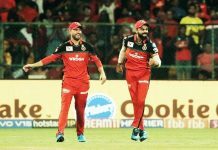 Prominent Sarpanches present on the occasion were Teg Singh, Kapoor Singh and Chain Singh. 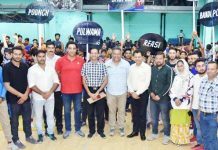 Winner of Ist malli bout Ajay Sharma was cash awarded with Rs 8,000 along with traditional Gurj (Gadda) and Sujandhar Keasi 2018 Pata by the chief guest Shiv Kumar Sharma, Saraf Singh, Sohan Singh, Prem Singh and Devinder Singh (Mangu), while runners-up Wrestler Ranjeet got Rs 7,000 by Tehsidar Akshay Rajan, Tehsildar Gulair Singh and Thakur Balwant Singh. 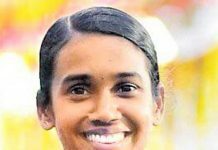 40 bouts were played in the one day long dangal. Sohan Singh (Sonu) contributed Rs 40,000 as financial Assistance to the organizer. 2nd main bout was won by Gopal Sharma of Jindrah who defeated Kulbir Singh of Danga Kote, 3rd bout was won by Bablu of Basantgarh who defeated Dalair Singh of Chinkah.